Kitchens are the most used rooms of our happy homes. Whether you are a food lover, an energetic 7-years old kid, a cook mum, or the helping father, kitchen is the place you have to visit most of the times. Despite having a great home décor, we usually neglect our lovely kitchens and use discarded floral curtains or old room curtains for them. Just like the other well painted and beautifully decorated rooms of our houses, we all want our kitchens to look nice and clean, but the time and energy it requires worry us and stop us from sensible spending. Let us help you find the perfect modern kitchen curtain ideas for your kitchens. Before we discuss them, consider the size and shape of your window along with your kitchen theme, and select the curtains accordingly. 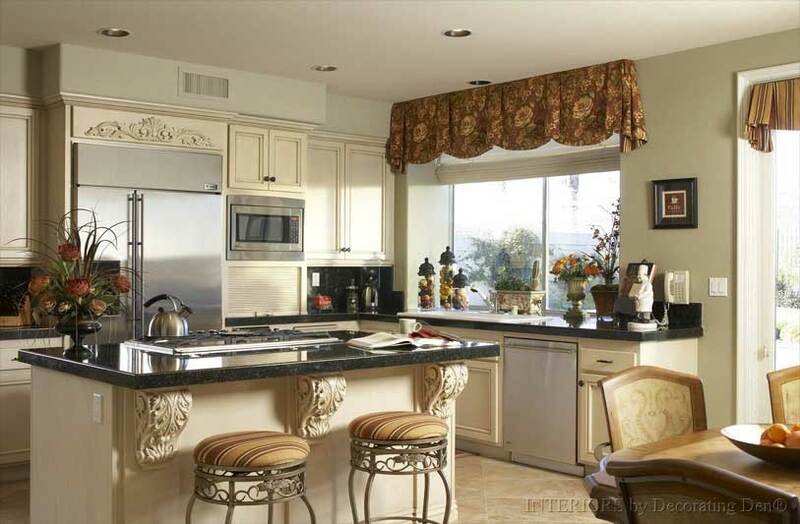 Royal velvet and silk curtains will provide a warm and cozy effect to your kitchen. Make this a part of your décor so that the family could enjoy their food in a great atmosphere. Combine these textures with valances and shades for an ideal look. When talking about modern kitchen curtain ideas, valances are the finest choice. They can also be used with silk materials to render an elegant expression to your kitchen. They cover only the top portion of the window and generally measure 18 inches in height. They can be mounted on ropes, draper poles and can be employed with or without drapery panels. Offering both decorative as well as functional advantages, valances are used as top treatments or window coverings. With infinite number of styles and shapes to choose from, you can go for straight, semicircular or triangle shaped valances. This idea is for the crafty, environmentally conscious homeowners. If you want to save on costs as well as put spare or old sheets and linens to good use, then go ahead and create your own simple drapes. The personal touch will make your kitchen feel homier, and if you use materials that have sentimental value, you can give new life to them! It’s a great way to showcase your space and really make it your own. There are many sewing tutorials online that can help you come up with a creative idea to fit your style and the kitchen space. If you find doing the sewing too confusing, you can opt to take your materials to a curtain maker along with an image for reference. Sometimes, the simplest-looking options are the classiest. The clean-cut look of rolled up Valance curtains or blinds is ideal for minimalists. The uncomplicated style allows you to make other decorative choices in the kitchen space and showcase statement pieces. These curtains create a sense of neatness and order. You can also use flat planes of this style as a showpiece if you decide to go for a print or graphic design that makes a statement, such as, a favorite painting or a bold accent color. Or you can draw attention away from the windows by employing a soft muted tone that blends in better with the walls and the paint. Not interested in a fabric option for your kitchen? Are your kitchen curtains look a little too old-fashioned and perhaps impractical? But you would still want to dress up the windows of course! So, why not practice green and use the space to hang up an indoor herb garden? The fresh herbs will be a delight to anyone who enjoys cooking, and the hanging planters will provide a bit of practical privacy at the same time. It is also a sensible interior design idea; adding a green element to any room can make it feel alive and welcoming. You can use different styles of planters for this; from individual pots strung up to longer horizontal “garden” like troughs. Fresh herbs for planting as well as planting supplies can be found in most farmer markets. Executing this idea can be a little difficult if you do not have experience with house plants but once you get the hang of it, this can be a very rewarding activity. It is a very old yet all-time favorite way of using stitched pieces of finest fabric to give your kitchen a classic look. With multiple of three or five pieces set, you can experiment with it as per your choice. The batten burg style is very popular and trendy with these types of kitchen curtains. One of the modern kitchen curtain ideas is to use bright colored curtains instead of white, as they lose their sparkle after some time. Floral curtains give a soothing and adorable look to the entire kitchen. You can choose the flower of your choice and interest to add to the beauty of your kitchen. Printed text messages and important reminders on the curtains with floral background are trending in modern kitchen curtain ideas these days. Glowing yellow daisies would not only make the kitchen look interesting, but will also have a soothing effect on your eyes after a tired cooking session. Find the stripe you like, to save up the effort of drawing them up again and again. If you are a skilled artist, you can opt for an easy option of sewing bandanas and simply join them to give a brilliant bold guise to your kitchen. There are limitless options of size, color and shape when doing it all yourself. Find easy to make curtain ideas and give your kitchen that sophisticated and elegant look you always wanted. Plaid can be a lovely option among modern kitchen curtain ideas. Combine the dark and light shades of black and white or brown and white to give an exciting appearance to your comely kitchen. The best thing about roman shades curtain is the availability of patterns you can use, thanks to their flat styles. Colorful zigzag pattern is ideal for your kitchen while having a toddler’s birthday or a friend’s reunion. Remember those old movies with French cafes or images of little eateries in Italy? They always had these lovely awnings that would come over the pavement for street-side dining. Well, the Bistro style curtains will give your kitchen that foreign café feel, by adding a classic yet quirky element. It is an easily recognizable style, yet so often overlooked! To avoid looking outdated and old-fashioned, consider a modern color palette and fabric. Keep it simple and avoid “classic” storefront colors like red and white and canvass looking fabrics. Instead, opt for a chic dark blue or forest green in richer material like satin or velvet. A sophisticated thick stripe is also a great idea to add color subtly.